Blog 2014 - Are we still sheepish about manipulating our genes? Are we still sheepish about manipulating our genes? 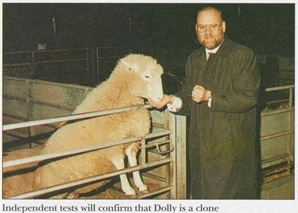 In 1996, in Scotland, the first successful genetic animal cloning took place, giving birth to the world’s most famous sheep, Dolly, who created a huge debate on scientific benefit versus humane treatment and ethics. This argument was escalated further when Dolly died fairly young of a progressive lung disease. As research into cloning progressed, research and discussion moved to "germinal choice." This would potentially allow for parents to select a specific set of genes that affect particular traits. For example, the child’s eye color, gender, and height could be "picked." Articles in many publications, including the periodical The Futurist, pointed this out, and discussed the possibility of gene selection for the prevention of genetic diseases. Today, China is leading the field of cloning. They have also taken on the science of gene sequencing, taking it to an industrial scale and producing hundreds of cloned animals every year. With this, we ask: could the future of cloning take hold and open doors for the medical field? Will this lead to the development of replacement organs? Will someone find a way to slow down the aging process? If you wish to study the topic further, an ideal place to start is the ProQuest Health and Medical databases, or look through a LibGuide. Stock, G. (2002) Choosing our genes, The Futurist, 36:4, pp. 17-23.